Are you kidding me? That thing is nothing but one giant elbow! How could it not elbow anyone out of anything? That’s like saying a hammer isn’t about to pound anything. 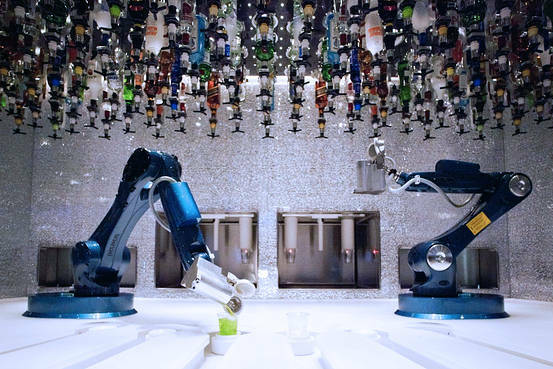 Of course, Mr. Aeppel factually and logically explains that more than anything else, robotic bartenders are simply tools to boost the productivity of human bartenders. But as anyone who had read this blog knows, when discussing robots and the coming robot revolution there is no room for facts or logic . So, of course the barbots will win us over with their aloof demeanors and cute names like Makr Shakr and Bartendro. Of course they will be subservient, what with their needing human supervision to function properly. Then, when you least expect it…WHAM! Elbow to the throat. And then you can add that to the list of problems they won’t listen to.